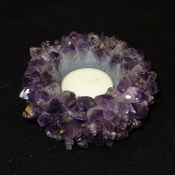 This Amethyst point candle holder stands approx. 1 3/4 inches. It is approx. 3 1/2 inches wide and holds a tealight. Each piece may vary slightly. This item ships free anywhere in the continental USA.